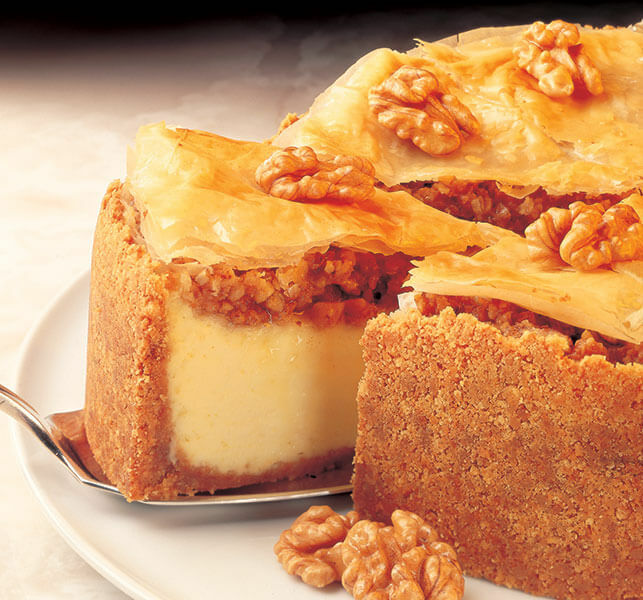 This delectable dessert melds two favorites among those with a sweet tooth — cheesecake and baklava — and tops things off with a flaky Phyllo crown. To cut Phyllo sheets into 9″ rounds, cut a pattern out of wax paper that is 9″ round, and fold in half. Fold 15 Phyllo sheets in half so short ends meet. Place the straight edge of the wax paper round on the folded edge of the Phyllo. Cut the Phyllo following the pattern. Layer and butter 5 sheets and place on cheesecake filling. Spread the walnut mixture over the Phyllo. Layer and butter another 5 sheets of Phyllo including top layer and place on top of walnut mixture. Layer and butter another 5 sheets, lightly score into 10 equal sections without cutting all the way to center or outer edge. Place on top of cheesecake. Trim Phyllo rounds to fit pan, if needed. This is the sweetest way to get a dose of your daily protein. 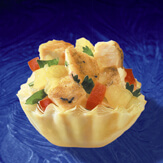 Juicy pineapple pairs perfectly with tender bits of chicken all piled on top of our Mini Phyllo Shells. 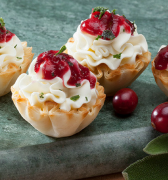 These easy-to-prepare appetizers bring a flavorful blend of cream cheese and goat cheese together with tart cranberries in a crunchy Mini Phyllo Shell.